If there is one thing I can’t stand, it’s manga or graphic novels adapted from another source. My general experience with them has been that they either lack substance, or just copy and paste text from the original source over some pictures. Because Monster Hunter Orage is an adaptation of a video game, rather than an existing story, the danger it ran was lacking substance, rather than a lazy story adaptation. Instead of retelling an existing story, Hiro Mashima had the creative freedom to do whatever he wanted with the story and characters. And unlike many other adaptive storytellers, Mashima knows how to make a story fun. On the surface Monster Hunter Orage is a basic shonen story. Shiki is the typical shonen hero, with the weirdness ramped up to twenty, on a quest to defeat the strongest legendary monster, that most don’t believe exist. The story isn’t delving into deep new territories, but considering this is a video game adaptation, I think a simple, serviceable story works to the manga’s advantage. The characters are basic shonen staples, and manage to provide an interesting enough read. Where Mashima shines is his ability to take generic characters, and treat them with seriousness where required, while still adding in as many jokes as possible. While they may feel generic, they are treated as proper characters, rather than placeholders. In this volume, three main characters besides Shiki are introduced. The first of these is Ailee, the action girl daughter of Shiki’s master, and the first of his companions. She is the exact opposite of Shiki, and several times during the first chapter she denies the virtues of comrades. It isn’t until she sees Shiki isn’t just full of empty words that she accepts him as a companion. The second is Sakya, an armorer and bowgunner, who Shiki and Ailee help get revenge for her parents against a Delma-loprey. Her story takes up two chapters, and is the highlight of the volume. It’s a solid story, with a good, serviceable reveal at the ending. The last is Curlon, also known as Prince. He is one of the low points of this volume. Curlon is the self-proclaimed rival to Shiki, but why he feels like this is never really explained. Curlon is a detestable character, whose opinions are shown to be incredibly self-centered and arrogant. I wouldn’t mind him so much, except that I’ve read enough manga to recognize a rival character. Curlon would work as an antagonist, but I can say with all confidence that isn’t how he is going to end up. Overall the manga is well put together. The action scenes in particular are where this manga shines. Since so much monster fighting happens, it allows Mashima to show off his abilities as an action manga artist. Where the art fails, however, is in the background design. The backgrounds are well drawn, but look generic and bland. Every location looks like the same location, robbing the manga from any sense of progression a travel story requires. 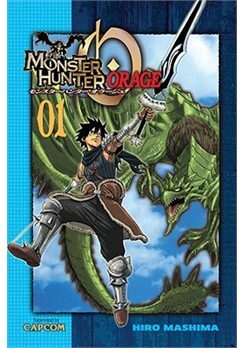 In the end, Monster Hunter Orage is a light read for fans of adventure manga, and fans of Hiro Mashima. Whether fans of the Monster Hunter games would like it I cannot say, having never played the games. But you can’t go wrong with a simple, light investment manga like this.